FAR Botanicals has created a natural hair serum that can also double as a luxury perfume oil for hair. Following its signature method of relying on a proprietary blend of essential fatty-acid rich ingredients, FAR Botaniclas’ Verde Oil Supreme is a natural hair conditioning serum that is waterless and 100% free of silicones and other cheap fillers. With the selection of a custom fragrance, it can be transform into a fine perfume oil for hair. Verde is designed not only to condition the hair, but to also act as an effective heat protectant up to 350° Fahrenheit. Crafted from a blend of over 15 moisturizing emollients, Verde is a light, silky serum that leaves hair incredibly soft, glossy and with greater resistance to breaking. I absolutely love this sampler set! I not only used the precious serum on my hair but also as a luscious fragrant scent on my body and I used their low scent to moisturize my face. And you'll love the smells! They are luscious and yummy! The serum is really good for your hair. It never made my hair look greasy, oily or smell weird. It gave it a silky, shiny finish with a gorgeous, light fragrance. You can find more about their wonderful sampler set here. Fragrance options for Verde Oil Supreme include: The Low Scent which is the serum oil with no fragrance added, Cocoa & Rum, Vanilla Narcotique, Lavender Absolute, Rose Rapture, Temple Hymn - (My favorite! Smells like baby powder), Blood Orange & Patchouli Musk, and Lilikoi (Passion Flower). Detailed descriptions of each of these fragrances can be found at www.farbotanicals.com/serum-oil-scents/. 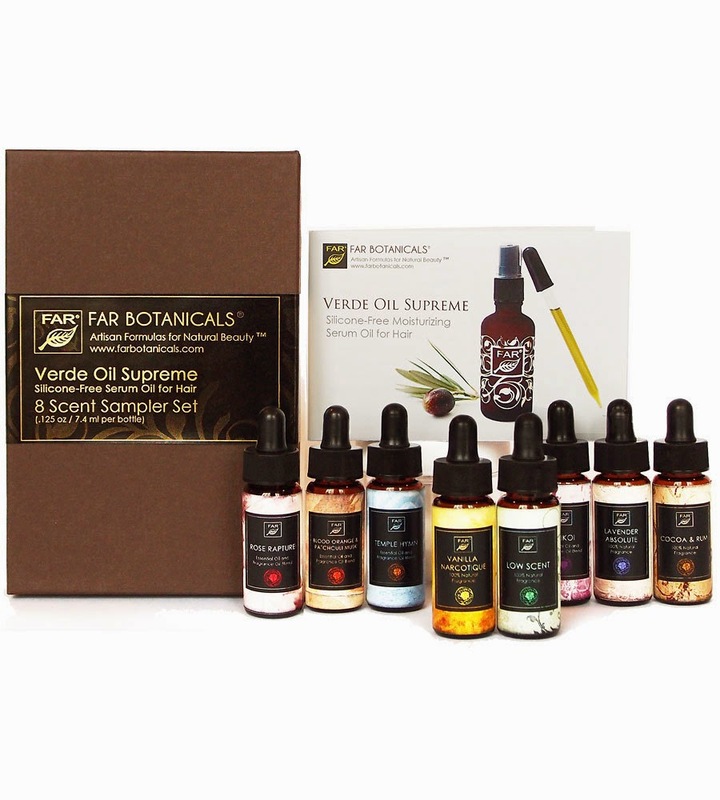 For more information on Far Botanicals Verde Oil Supreme beauty oils and more natural haircare, please visit: www.farbotanicals.com.